I asked a lot of my husband when we decided to move to Perth, and settled in here. He left his native country, his friends and family, his A & W Root beer, Chik-fil-a, Fruit of the Loom underwear and socks, shooting guns, candy containing peanut butter, his big Dodge Ram truck and paying for fuel (gas) at the pump (whilst also ordering a pretzel melt..mmmm Sheetz), amongst other things. 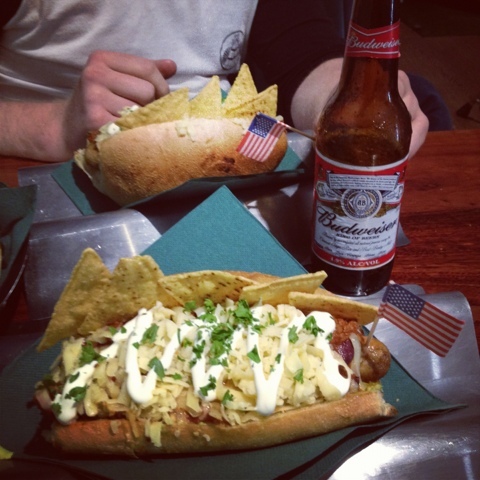 Tonight we had a classic American meal at one of our favourite hot dog places. They served up a Chilli Dog, with the lot: guacamole, cheese, tortillas chips, sour cream. And it was amazing. 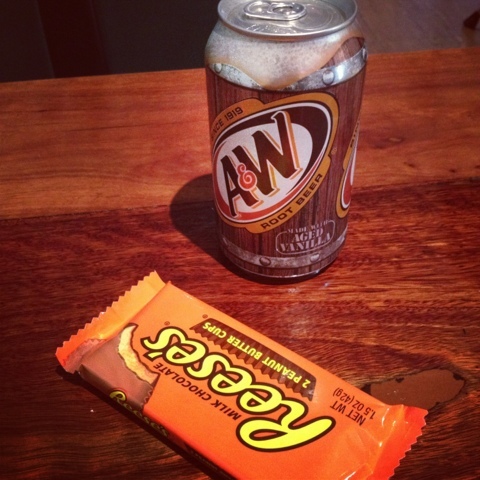 We had a Budweiser to drink each, he also had an A&W Root Beer to drink, and Reese's peanut butter cups for dessert. Yeah we overdid it, and are feeling horribly full and a bit gross, but hey, it isn't everyday you get an amazing feast of American style goodness in these parts!